Aside from preventing a choking hazard, there is another really good reason to heed the generations long, sage advice of eating slowly and chewing your food well: digestion. Proper digestion is of the utmost importance in ensuring the optimal breakdown, absorption and utilization of the nutrients in food. If all those carbohydrates, proteins, fats, minerals and vitamins aren’t properly digested, you aren’t going to be absorbing those nutrients well, and your body won’t be able to utilize everything that you take in. And an MTHFR Kid needs to be getting in as much as they can through their food because they already have a limited ability to convert some of these nutrients once they’ve been absorbed. So what can we do? And where do we start? Let’s break it down from brain to bottom, because digestion starts way before food gets into those little tummies… it starts in their brains. Ugh. Trying to get my kids to sit at the table. Trying to get my kids to sit with their entire butts on the chair at the table. Trying to get my kids to sit with their legs forward at the table. It seems an impossible task in our house. There are seemingly endless variations of motion in just… sitting. But here’s the thing: sitting at the table is important. Taking a moment to relax before that first bite is important. Before we take that first bite of food, our digestion has already started. Seeing that food on the plate, smelling it in the air… those are signals to our brain. Our brain gets the “Hey, we are about to get our om nom nom on!” signal from our senses, and it tells our mouths and tummies to start the digestive juices flowing. (You’ve probably heard the phrase “mouth watering”.) If we aren’t in a relaxed state, in what’s called parasympathetic mode, those signals don’t work quite as well, hindering our body’s ability to digest what we take in. All before we ever take a bite! Do what you can to get those kids to sit for meals — take the best you can get at any given meal. Before that first bite of food take a moment for grace, either with a statement of gratitude or a small prayer. This will help your body switch into rest and digest mode — increasing saliva production, releasing digestive enzymes and gastric juices, and setting digestion off to a good start. Remember all that mouth watering your kids did when they saw and smelled that yummy-and-healthy-meal-you-spent-a-lot-of-time-preparing-that-they’ll-say-is-yucky-before-they-ever-take-a-bite-and-won’t-fully-appreciate-until-they’re-out-living-on-their-own? All that saliva contains an enzyme called salivary amylase which breaks down carbohydrates. Carbohydrate digestion starts in the mouth, so if those carbs aren’t broken down well there, the potential for digestive dysfunction down the line is greater. Chewing food well and breaking it down into smaller pieces helps the rest of our digestive tract further down. At a minimum, aim for about 30 seconds of chomping per bite of food. 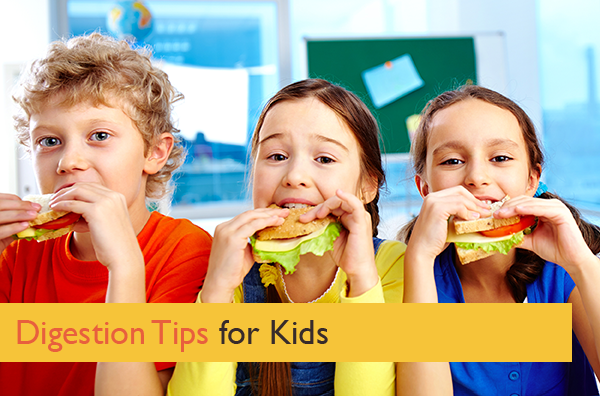 Encourage them to put down their utensils between bites so they aren’t just shoveling it in their mouths. Tell them their tummies will thank them. Adding raw and fermented foods to your meals can really give digestion a boost. Raw and fermented foods contain loads of enzymes that aid in much of the breakdown of the food your kids are eating. This reduces the burden placed on the pancreas to release enzymes to do that work. Heat destroys enzymes, so any cooked foods you’re eating have virtually no enzyme content, which is why adding raw and fermented foods is a good idea. I’ve found it really easy to incorporate raw and fermented foods into every meal for my kids — even school lunches. Carrots, broccoli florets tossed in a bit of olive oil and salt, cucumbers, tomatoes — lots of options for little hands and mouths. Pickles and even kraut in a small container inside a lunch box make including fermented foods in lunches easy too. Sipping on a bit of water while eating can be helpful, but drinking too many liquids with meals will dilute digestive juices, and you definitely don’t want that to happen. Why? The answer to that really deserves a blog post of its own, but in a nutshell, it will prevent the proper breakdown of food which can lead to a whole host of other problems. There are some exceptions to this, like sipping on bone broth with meals (or if you’re like our family, veggie faux ‘bone’ broth). There is a fantastic concentration of vitamins and minerals in bone broth, and the collagen it contains is very healing to the lining of the intestines. Another exception is drinking a teaspoon or two of cabbage juice about 5-10 minutes before a meal. It is also very healing, and stimulates acid production. My kids love cabbage juice; I thought the stuff would be really nasty, but it has a bit of a sweet and milky taste. I also offer fermented cabbage juice with meals. I just poor some sauerkraut juice right out of the container and into a little shot glass. Yum! By now you probably know that probiotics are the beneficial bacteria living in your gut. They aid in the digestion and absorption of nutrients, and are critical to proper immune function. Probiotics also synthesize vitamins in the body, one of which is B12. B12 is a major, major player in the methylation cycle, and those with MTHFR variants are susceptible to B12 deficiency. Here’s another opportunity, courtesy of our own gut, to help boost B12 in our body. And those fermented foods I mentioned above? In addition to enzymes, they are also teeming with probiotics. Two birds, one stone. It’s easy to see why incorporating fermented foods in your day to day is a really good idea. There are also many probiotic supplements available online or in stores. Kids needs to be digesting their food well. If they aren’t, it could to set them up for problems down the road. Hopefully, these simple but important tips for aiding digestion give a good idea on how to ensure your kids are building a good foundation for health.